Squatter’s shacks in “Hooverville,” Portland, Oregon, Arthur Rothstein, 1936. 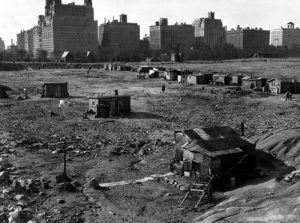 Hooverville: A crudely built camp put up usually on the edge of a town to house the many poverty-stricken people who had lost their homes during the Depression of the 1930s. 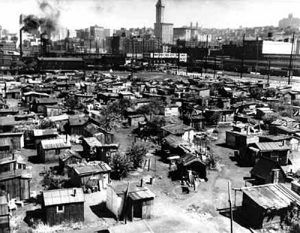 Many of the shanty towns that sprung up all over the nation during the Depression were facetiously called Hoovervilles because so many people at the time blamed President Herbert Hoover for letting the nation slide into the Great Depression. Coined by Charles Michelson, the Publicity Chief of the Democratic National Committee, it was first used in print media in 1930 when The New York Times published an article about a shantytown in Chicago, Illinois. The term caught on quickly and was soon used throughout the country. Though homelessness has been a problem throughout the ages and was a common sight in the 1920s, as hobos and tramps lounged in city streets and rode the rails, it has never been more present in the United States as it was during the Great Depression. 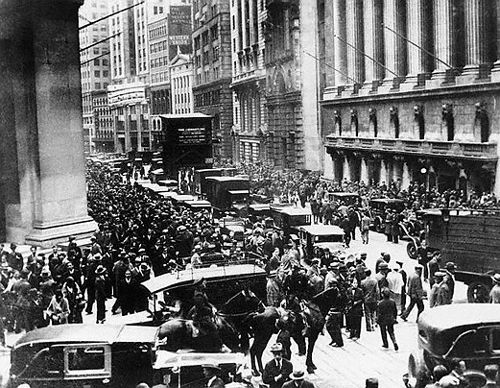 The causes of the Great Depression were many and varied, beginning with rapid economic growth and financial excess of the “Roaring Twenties.” During this time, many Americans were quickly buying automobiles, appliances, and speculating in the stock market. Unfortunately, much of this wild spending was done on credit and while businesses were making huge gains, the average workers’ wages were not increasing at anywhere near the same rate. But, like other “booms” throughout history, the cycle soon led to a “bust.” As manufacturing output continued and farmers were overproducing, circumstances began to change, leading to falling prices and rising debt. At the same time, there was a major banking crisis, serious policy mistakes of the Federal Reserve Board, and with the stock market crash in October 1929 the country was thrown into a full-blown depression that would affect the nation for nearly a decade. Businesses began to lay off people, which was quickly followed by homelessness as the economy crumbled in the early 1930s. Homeowners lost their property when they could not pay mortgages or pay taxes. Renters fell behind and faced eviction. Many squeezed in with relatives, but hundreds of thousands were not so fortunate. Some defied eviction, staying where they were, others found refuge in one of the increasing numbers of vacant buildings, more found shelter under bridges, in culverts, empty water mains, or on vacant public lands, where they built crude shacks. When the Dust Bowl began in 1931 it made matters even worse. By 1932 millions of Americans were living outside the “normal” housing market. Between 1929 and 1933, more than 100,000 businesses failed across the nation and when President Hoover left office in 1933, the national unemployment rate was nearly 25%. As these many people used whatever means they had at their disposal for survival, they blamed Hoover for the downfall of economic stability and lack of government help. Making matters worse, the minimal federal help that was provided often didn’t go to the sick, hungry and homeless, as many state and local politicians of the time, were corrupt. These teeming communities of makeshift shacks known as “Hoovervilles,” were often concentrated in cities close to soup kitchens run by charities. The shelters themselves varied widely, from stone houses and fairly solid structures built by those with construction skills, but, far more that were thrown together with wooden crates, cardboard, tar paper, scraps of cloth and metal, and various other discarded materials. Within their shelters, most people had a small stove, a few cooking implements, some bedding, and little else. Horse-drawn automobiles were often referred to as “Hoover Wagons” during the Great Depression. More derogatory terms blaming Hoover were also coined including a “Hoover blanket,” which was old newspaper used for blanketing; “Hoover leather” was cardboard used to line a shoe when the sole had worn through; a “Hoover wagon” was an automobile with horses tied to it because the owner could not afford fuel; freight cars used for shelter were called “Hoover Pullmans,” and a “Hoover flag” was an empty pocket turned inside out. These settlements were often established on empty land and were rarely “recognized” by authorities as they were tolerated or ignored out of necessity. However, that was not always the case, especially if the occupants were trespassing on private lands and some cities would not allow them at all. In May 1933, President Roosevelt’s “New Deal” enacted a special relief program called the Federal Transient Service (FTS). Shelters were established by the program that provided food, clothing, medical care, and training and education programs. The relief also provided for rooms in boarding houses and rent payments. A few camps were established in rural areas but, in the cities, the Federal Government saw the problem as a local one. The program helped many, it was unable to thousands of others and just two years later, in 1935, it was phased out. The plan was then to get the homeless into work-related programs, such as the Works Progress Administration (WPA). However, only about 20% of those formerly housed by the FTS was able to get jobs in the work programs. Though some were eligible for the Resettlement Administration camps established for migratory workers, it was still not enough. One such Hooverville “town” was located in New York City’s Central Park. When the stock market crashed in 1929, it occurred just as a rectangular reservoir north of Belvedere Castle was being taken out of service. By 1930, a few homeless people set up an informal camp at the drained reservoir but were soon evicted. But, having nowhere to go, they would come back and as public sentiment became more sympathetic, they were allowed to stay. Called “Hoover Valley,” the reservoir soon sported a number of shacks on what was labeled “Depression Street.” One was even built of brick with a roof of inlaid tile constructed by unemployed bricklayers. Others built a dwelling from stone blocks of the reservoir, including one shanty that was 20 feet tall. Though the settlement could not have been popular with the tenants of the new Fifth Avenue and Central Park West apartments, they mounted no protest. There were other such settlements in New York – one called “Hardlucksville” which boasted some 80 shacks between Ninth and 10th Streets on the East River. Another called “Camp Thomas Paine” existed along the Hudson in Riverside Park. The Central Park disappeared sometime before April 1933 when work on the reservoir landfill resumed. In Seattle, Washington stood one of the largest, longest-lasting, and best documented Hoovervilles in the country, standing for ten years, between 1931 to 1941. 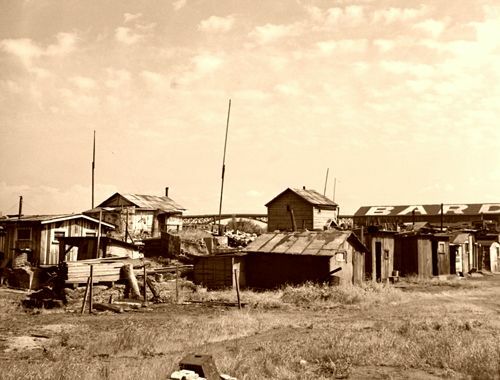 Though there were several located about the city, this Hooverville was located on the tidal flats adjacent to the Port of Seattle. The camp began when an unemployed lumberjack Spread over nine acres, it housed a population of up to 1,200. The camp began when an unemployed lumberjack named Jesse Jackson and 20 other men started building shacks on the land. Within just a few days 50 shanties were made available to the homeless. However, the Health Department soon posted notices on every shack to vacate them within a week. When the residents refused, the shacks were burned down. But, they were immediately rebuilt, burned again, and rebuilt again, this time underground, with a roof made of tin or steel. With Jesse Jackson acting as a liaison between Hooverville residents and City Hall, the Health Department finally relented and allowed them to stay on the condition that they adhere to safety and sanitary rules. Jackson became the de facto mayor of the shantytown, which also included its own form of community government. The “town” existed until the land was needed for shipping facilities prior to World War II.